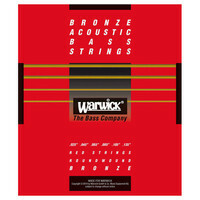 Set of six bronze bass strings for acoustic bass; long scale round wound. Well-balanced and melodic with a warm and vocal sound. This entry was posted in Warwick and tagged Guitar-and-Bass. Bookmark the permalink.